Yes, this is the issue where we start off with one of the most groan-inducing bits of alleged humor that the Ultraverse ever saw. Even in 1993, a joke involving the old television show McCloud was pushing it in terms of being relate-able for the audience. Moving on from there, we see our new group of heroes continuing their pursuit of answers. After a quick origin recap, we begin to see the early stresses about who will be the leader of the team — Elena is the natural person to do it, given her personality and her experience but Bob is someone that people relate to and he’s a little less in-your-face when it comes to ordering people around. We also get some neat scenes as both Candy and Dave experiment with their powers and learn a bit more about their limitations. All of this leads to The Strangers discovering the homeland of Yrial — a floating island, hidden behind a magical cloud. If this sounds like something out of an old pulp novel, that’s because it is. Our heroes are captured but Dave’s continuing path of power discovery leads to their freedom — but not before Bob learns that not only can he transform items, he can also transform languages! Yes, it was a bit of a stretch. Anyway, it turns out that Yrial’s people are a mysterious bunch who worship something called the Starfoam and who may have knowledge of the entity that granted our heroes their powers. The tribe’s leader orders Yrial to accompany The Strangers back down below, both learning from them and teaching them of their ways. 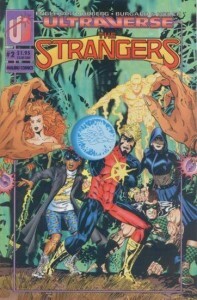 The issue ends with Bob officially christening our team as The Strangers. Hmm. I love this series but I felt that this particular story was a major misstep. It was simply too early to abandon the down-to-earth feel of the first issue and go gallivanting around on a floating island. When we return to the more “mundane” world of superhero action in issue 3, this story feels all the more unusual. Plus, Yrial was by far the least interesting member of the team to me… and while the rest of the group was tied together by their origin, Yrial’s early inclusion seemed to weaken the bonds that held them together. Art-wise, it’s solid as Rick Hoberg continues to do some lovely work on the facial expressions. Still no costumes (aside from on the cover) but they’re coming, for good or bad! Speaking of the cover, I don’t really care for this one — for a posed image, it looks pretty busy. Things will pick up in issue three as TNTNT is introduced! TNTNT! I’ve always felt the book starts rolling around 3 and 4. Pre-Pilgrim days.